1. In medium bowl, toss tuna with canola oil (this ensures perfectly seared tuna). Set aside. 2. Heat wok or large, heavy skillet to medium-high to high heat. Spray canola oil cooking spray to coat skillet; add smashed garlic and ginger pieces to flavor oil. After 20 seconds, add carrots. Cook for 2 to 3 minutes, then add asparagus. Spray more canola oil if necessary to keep vegetables from sticking. Cook for additional 2 minutes or until asparagus is bright green and carrots are tender. Remove vegetables from skillet and set aside on flat plate. 3. Spray skillet with canola oil cooking spray or oil. Add mushroom pieces. Cook for 2-3 minutes until browned. Remove from skillet and set aside with other vegetables. 4. Reheat pan to medium to high to high heat. Add tuna in two batches without crowding skillet. Gently move tuna around with spatula. Sear tuna until just cooked. Remove first batch from skillet and set aside. Repeat with second batch, leaving in wok or skillet. 5. 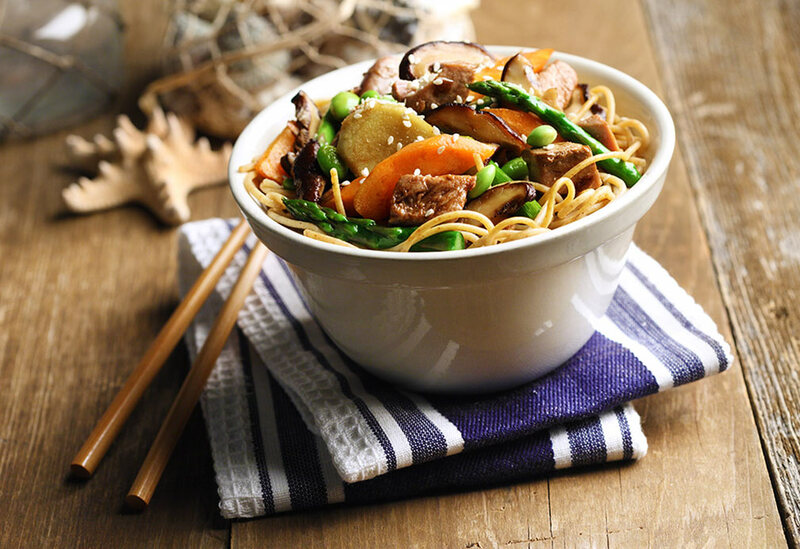 Return carrots, asparagus and mushroom to wok or skillet. Add edamame and first batch of tuna. 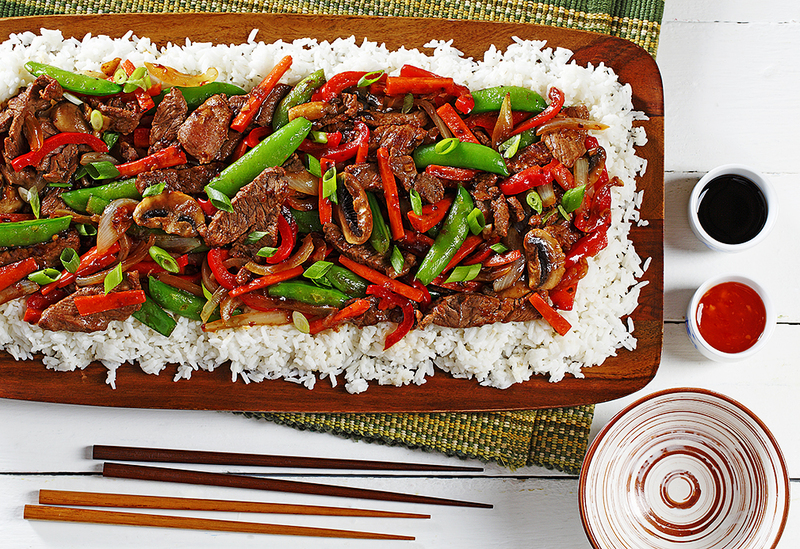 Make a well in center of stir-fry ingredients and pour sauce in middle. Coat vegetables with sauce and quickly bring to a boil. 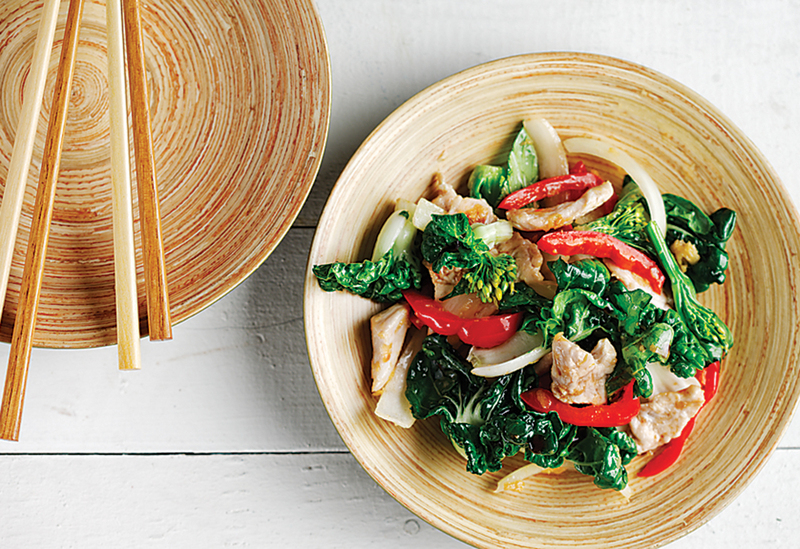 Serve tuna-vegetable mix over hot vermicelli. 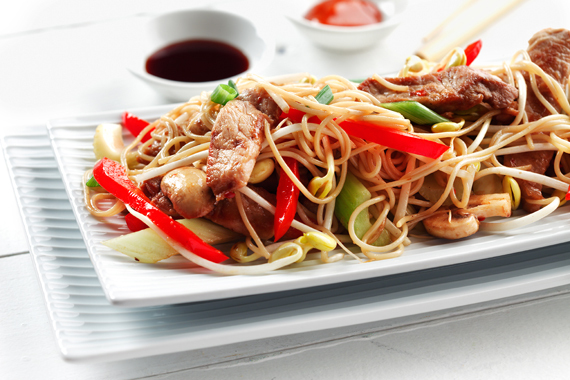 Tips: For stir-fries, most of the effort is put into preparing vegetables and having them ready once it's time to cook. It's important to cut vegetables the same size so they cook evenly. Feel free to use the vegetables you have available.